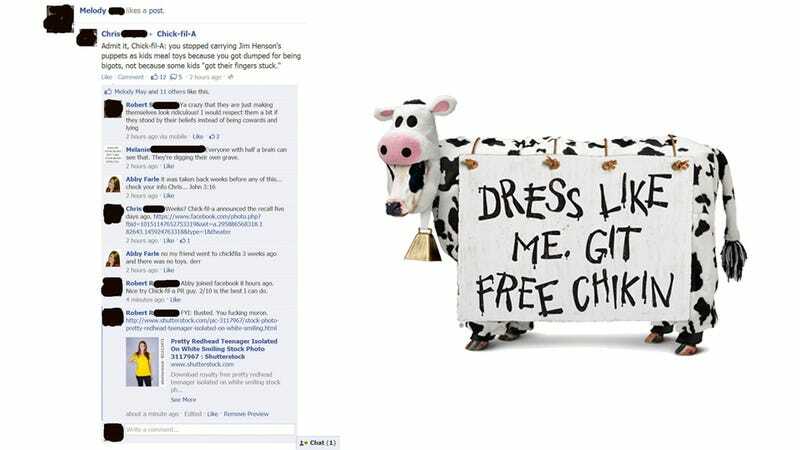 Chick-fil-A, home of chicken-loving bigots, is in the middle of a PR nightmare. After Chick-fil-A's COO admitted to being anti-gay, the Jim Henson Company (bless their heart) pulled their toys from Chick-fil-A's kids meals. Only Chick-fil-A claimed the toys were pulled because of a "possible safety issue". That, of course, is a complete lie. A lie that the company may be propagating with fake Facebook accounts of Chick-fil-a sympathists. "We have seen this and it is not true. Chick-Fil-A has not created a separate or a false Facebook account. We don't know who created it."